Karl Johnson turns a photograph of your loved one into both a portrait and sterling silver pendant. Even before cameras, people still craved a good profile pic. The solution, they discovered, was in the shadows. 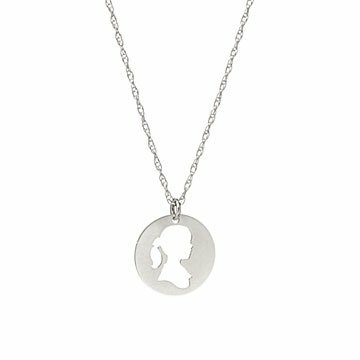 Now loved for its understated elegance, the silhouette captures a face's subtle details in a more artistic way than, say, a selfie. Karl Johnson will turn a photograph of your loved one into both an 8 x 10 hand cut silhouette portrait and a sterling silver pendant, creating a pair of classic keepsakes you'll want to pass down for generations to come. Handmade in California. Silhouette artist Karl Johnson has been practicing the unique art form for most of his life. He learned it as a young boy from his father, and has a theory for why he took to it so well: vision in only one eye. "Not having binocular vision forces me to judge the distance and shape of an object by examining its shadow," he says. Estimating he has freehand-cut hundreds of thousands of silhouettes so far in his career, Karl works and lives in Southern California with his wife Lauren, son Cooper, and daughter Tenney. Pendant: .8" Dia Chain: 18"